Becoming a PADI Specialty Instructor is a natural progression for professionals wanting to expand their horizons, and to increase their employment opportunities. 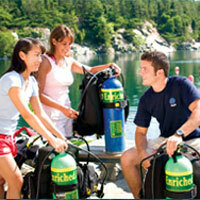 The more Specialties that a dive Pro can teach, the more they have to offer. It's also a fantastic way to keep teaching (and diving) fresh and fun. They say "variety is the spice of life", and, whoever "they" are, they're right about this one. As a PADI Divemaster, you are eligible to take Digital Underwater Photography and Emergency Oxygen Provider specialty instructor training courses. This gives DMs a chance to see what teaching is like, and can help guide the decision to become a PADI Assistant Instructor or a PADI Open Water Scuba Instructor. As a PADI Assistant Instructor, you may become a Specialty Instructor in only those specialty courses that do not include open water dives. PADI Open Water Scuba Instructors can choose from any of the 27 standard specialty courses that PADI offers along with distinctive specialty courses offered by us, such as the often requested Self-Rescue Diver Specialty course. Having five specialty instructor ratings is a prerequisite for the Master Scuba Diver Trainer (MSDT) rating.